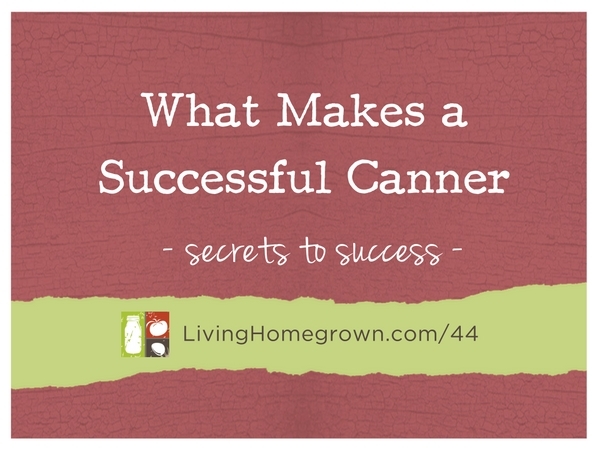 LH 44: What Makes A Successful Canner? What Makes A Successful Canner? Learn 5 Traits of a Successful Canner! Pssssst – you don’t need to be a master chef to be an amazing canner. And you also don’t need fancy pants equipment. In fact, you probably already have everything you need in your kitchen! I’m revealing the 5 characteristics or traits you need to bring to the table when you’re putting up the harvest. When you have these in place, you can take your preserve-making to the next level. First, let’s talk about what makes a successful canner. Being successful when canning is NOT about being perfect. Trust me, every canner has a runny jam or a failed recipe at some time. So, no – having the recipe look perfect is not the goal. To me, success is that you have captured seasonal flavors and you enhanced it or showcased it in the jar. It is the capture of the fleeting moment of flavor that makes a good canner. Yes, the flavor is the success! When things do go wrong, a confident canner knows other ways to use that runny jelly. It can be used as a syrup, in a jamtini cocktail, a sauce, salad dressing…the list goes on and on. But the point is that the FLAVOR is still in there. So if that is the key to success, what are the 5 key traits we need to get that? By using produce that is IN SEASON, you are starting with the best flavor right off the bat. It is much better to use produce that is fresh-picked (either from your own backyard, your neighbor, your local farmer’s market) than it is to use produce that was either forced into season (hot-house strawberries, anyone?) OR was shipped across the country from another area or other country. Produce that is shipped must be picked early (not when the flavors are at its peak). And that shipped produce is chosen for its traveling characteristics – NOT its flavor. So stick with homegrown or locally-sourced produce that is in season and you are far ahead of the game in terms of flavor. You’ll have a lot more success with a lot less effort. That way, your canned product will reflect the best of the season – which is sort of the point. Be willing to try things outside of your comfort zone. Shake up your taste buds a bit and try new fruits, new combinations or a whole new type of preserving. Think of it as a culinary adventure. But just to be clear…When I say “have a sense of adventure”, I don’t mean be unsafe! Don’t throw caution to the wind or ignore USDA recommendations or guidelines. Instead, just be willing to try new things like canning pie filling, dehydrating or fermenting. It also means that you’re willing to shake up your taste buds a little bit and try different fruits and different combinations of fruits. Maybe try (or grow) pluots or pluerries. Haven’t heard of those yet? Check out the links below for more info. Yes, the freshness of the produce in your preserves is very important. But so is the freshness in your flavorings. For any flavor additives (think spices and herbs here), the fresher that flavoring is, the better the flavor. And because that fresh flavor is strong, you can add a lot less to your preserves. You may be wondering about pH safety when you add things like herbs or spices. Well, it is okay to add a small amount to your preserves (usually half a teaspoon to one teaspoon of a ground spice) and it is safe. But where you get into trouble is when you add vegetables or things like like garlic, onions and celery to your preserves. Don’t do add those items without a tested recipe because they WILL affect the pH and can make your preserves dangerous. Now lemon is usually in a recipe to help adjust the pH. It can be there to help with the gel in a jam or jelly and it can sometimes be there to help keep another wise borderline recipe in the safe zone (pH-wise). But fresh lemon can also brighten flavor. Just as salt can enhance a cooking recipe, so too can lemon enhance a sweet preserve. Now, you don’t want to go nuts and add fresh lemon to everything because you may mess up the delicate acid balance and that can cause problems. But when you have a jam, jelly or fruit preserve that does not call for lemon, you can usually get away with adding a little squeeze of fresh lemon to mix. If your recipe already calls for lemon, it’s not always be a good idea to add more. So instead, you can just add some lemon zest and that can help bump up your flavor. I’m talking a teaspoon of zest to one batch of preserves. The use of lemon should just give a little bit of zing. It’s very subtle, but it’s there. You can enhance flavor with the spices and with the herbs but you have to understand how to do it subtly. And that is a sign of a good canner. You always want to be showcasing those flavors and not covering them up. Think of flavor enhancers (spices, herbs, lemon) as accessories to an outfit. They are there to shine a spotlight – not overtake the show. So keep in mind that a little bit goes a long way. You can always add more but you can’t take it out. Here is a video explaining Pluots, Pluerries, etc. Pluots: These trees are non-GMO hybrids of plums and apricots. This link is where I bought mine from Peaceful Valley Nursery, but there are other sources online. You can substitute any pluot for a plum in a canning recipe. Pluerries – These trees are non-GMO hybrids of plums and cherries. This link is where I bought mine from Peaceful Valley Nursery.